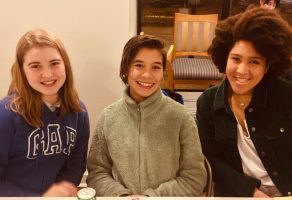 GIRLHOOD update – CPA Theatricals, Inc.
GIRLHOOD, one of the musicals we are developing now, is a song cycle that follows the lives of four girls as they make their way from middle school through high school. We have been working in the show for about 18 months and are thrilled with the progress. I started this project by conducting, along with a female colleague, about a dozen interviews with girls aged 10-21. With my imagination filled with their stories, I created the characters, then wrote the story, and then defined the series of songs. Last November and December we ran several workshops where we taught about 25-35 girls and boys some of the songs and dances. We learned a lot from those workshops – the key was too high, or we needed more exposition, or the song was too long. Then we went back to the composers and asked for adjustments. Now, what makes GIRLHOOD so special is that the score has been written by 14 different composing teams. Each team has a femme-identifying member. The result has been wonderful songs – and songs that are delightfully varied. But we did have a big question: how can we be sure that the songs are cohesive? Does the story come through clearly with these different perspectives? Given the different styles of numbers, will they work together? 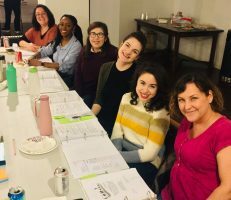 To answer those questions, the creative team realized we needed to organize a full, private reading/sing through of the show using adult actresses. So, a few weeks ago – this private table read happened. To speed things up, we used outstanding adult actresses and a magnificent musical director. They came together for three evenings of rehearsal, and then presented the reading. The creative team (including three 10 year old girls) came together and listened to the songs and dialogue. First, we learned that the show was in great shape. The characters were coming through loud and clear. Each had a character arc and the music reflected the characters’ motivations and actions. Of course, we will need to make some adjustments, some additional dialogue and maybe add another song or two. And we also were delighted (relieved????) to learn that the songs DO work well together. We needed to move two of the songs around. But we felt the different styles (hip hop, country, Broadway, jazz) all worked well together. Now, back to the script and songs for re-writes. And while we’re doing that, we are also preparing the music for performance – both orchestrations for live music and recorded accompaniment tracks for performance. And what’s the destination? GIRLHOOD plays July 9, 10, 11 at Bravo Performing Arts in Oak Park, IL. Excitement reigns! « I am ready for SPRING!